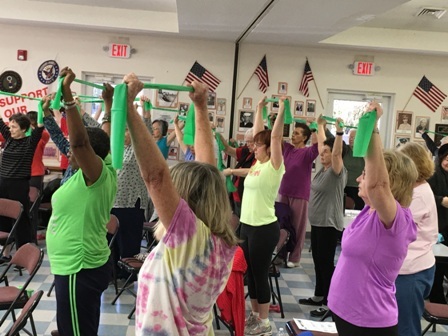 Geri-Fit® is a highest tier level III evidence-based physical activity strength training exercise program designed for older adults who want to improve their strength, balance, flexibility and cardiovascular endurance. Geri-Fit accommodates all age groups from 60-100. Each person is encouraged to work out at his/her own pace. The instructor will provide plenty of one-on-one assistance to assure that you're learning the correct way to work out with weights. We suggest individuals start out using a set of 2-pound dumbbells and then, as their strength increases, they can use heavier dumbbells in order to build more strength and balance. There's no aerobics, dancing or choreography to learn and there's no floorwork. Most of the exercises will be performed seated in chairs. Geri-Fit is an ideal ongoing evidence-based exercise program for chronic disease self-management such as diabetes, heart disease (CVD), pain, arthritis, and weight loss/management as well as an ongoing EBP for fall prevention course graduates. Classes can be held two or three times-a-week for 45-minutes each time. Golf-Fit® Strength and Stretching Class - Muscles are the key ingredient in helping you drive the ball further and with more accuracy. This strength training exercise class strengthens and conditions the muscles of the back, legs, hips, chest, shoulders, and arms. We'll work on golf specific exercises and stretches that will help improve your golf game. Recommended for all golfers... beginner to advanced! Enrollment is open to men and women. Older golfers have the option to do the exercises in a chair. Bring a set of 2 to 5-pound (each) dumbbells (depending on your age and strength), a stretch band, your 5-iron, and water to drink. Classes are taught by a certified instructor. Geri-Flex® is a 30-minute stretching program for active older adults. It combines the best stretches from ballet, pilates, tai chi, and yoga. Students are required to get on the floor, so they'll need to bring an exercise mat and stretch band. We'll work on improving joint mobility, flexibility, balance, and muscular strength. All age groups. Note: This program can also be taught chair-based so that all floor stretches are eliminated. Stretch at your own pace and fitness level. Geri-Fit® Private Lessons are great for older adults that want exercise supervision at their home or want to specifically work on an balance improvement and fall prevention. Personal fitness training allows you the opportunity to work one-on-one with a Certified Geri-Fit® Senior Strength Training Specialist at times that are convenient to your schedule. Whatever your goal is, we can help you get stronger, improve your mobility, increase your range of motion, and improve your balance and functional capacity. Sessions can be 30 or 60-minutes long and all equipment is provided. By appointment only. Call 1-888-GERI-FIT x4 for more information. Body Sculpting™ is a one-hour all weights strength training exercise program. The class requires a set of 3 or 5-pound dumbbells, an exercise mat and a stretch band. There is no choreography or dance moves to learn. The instructor will provide plenty of one-on-one instruction in the group setting so it will be like working out with your own personal fitness trainer. Suggested for all age groups age 18 and over provided the participant is in reasonably good shape and can perform full repetition squats and lunges. 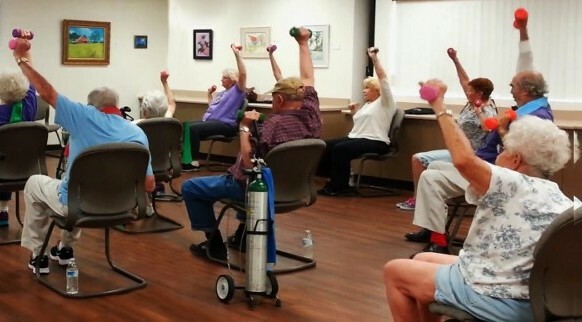 A chair may be used for balance by older participants that sign up for this class. Health Fair, Fall Prevention Expo, and Balance Screenings: Meet professional health care providers that are dedicated to helping seniors stay fit and healthy. The Geri-Fit Company offers free information on strength training exercises that you can do at home to help regain strength that's been lost through the aging process. We'll also talk about ways to make your home fall-proof so that you lessen your chances of falls. This presentation is a sit, watch, and learn... participation is not required. You're welcome to take notes and handouts will be given. Free! Call 1-888-GERI-FIT x1 for more information. If you would like to offer any of these programs at your facility, visit our licensing page or call 1-888-GERI-FIT (1-888-437-4348 x2).